Global diabetic foot ulcers and pressure ulcers market expected to generate around USD 5,265 million by 2025, at a CAGR of 6.6% between 2019 and 2025. Diabetic foot ulcers have a significantly negative impact on patients and are highly prone to contamination, which can sometimes even lead to amputation. The report covers a forecast and an analysis of the diabetic foot ulcers and pressure ulcers market on a global and regional level. The study provides historical data for 2017 and 2018 along with a forecast from 2019 to 2025 based on revenue (USD Million). 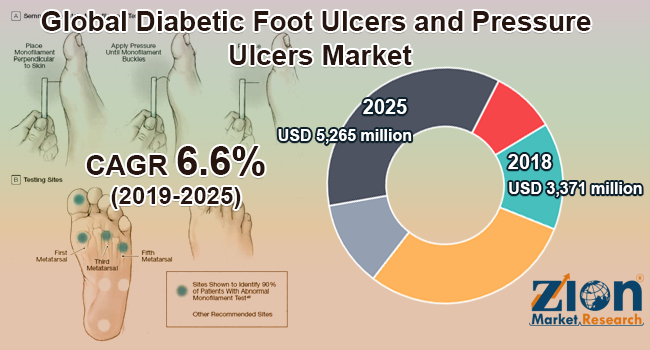 The study includes drivers and restraints for the diabetic foot ulcers and pressure ulcers market along with the impact they have on the demand over the forecast period. Additionally, the report includes the study of opportunities available in the diabetic foot ulcers and pressure ulcers market on a global level. In order to give the users of this report a comprehensive view of the diabetic foot ulcers and pressure ulcers market we have included a competitive landscape and an analysis of Porter’s Five Forces model for the market. The study encompasses a market attractiveness analysis, wherein all the segments are benchmarked based on their market size, growth rate, and general attractiveness. The report provides company market share analysis to give a broader overview of the key players in the market. In addition, the report also covers key strategic developments of the market including acquisitions & mergers, new treatment launch, agreements, partnerships, collaborations & joint ventures, research & development, and regional expansion of major participants involved in the market on a global and regional basis. The global diabetic foot ulcers and pressure ulcers market is segmented based on the type of wound, treatment, end-user, and region. All the segments have been analyzed based on present and future trends and the market is estimated from 2019 to 2025. By type of wound, the global market is bifurcated into diabetic foot ulcer and pressure ulcer. The diabetic foot ulcer is further segmented into Grade 0, Grade 1, Grade 2, Grade 3, Grade 4, and Grade 5. The pressure ulcer segment is classified into Stage 1, Stage 2, Stage 3, and Stage 4. By treatment, this global market is segmented into bio-actives, wound care dressings, and wound care devices. The bio-actives segment is further segmented into growth factors, skin substitutes, and skin grafts, and other bio-actives. The wound care dressings segment is sub-segmented into foam dressings, alginate dressings, surgical debridement, film dressings, hydrocolloid dressings, and hydrogel dressings. The wound care devices segment is further divided into ultrasound therapy, negative pressure wound therapy, and others. The end-user segment includes hospitals, community health centers, home healthcare, and others. By geography, the global diabetic foot ulcers and pressure ulcers market includes Latin America, North America, Asia Pacific, Europe, and the Middle East and Africa with its further division into major countries including the U.S., Rest of North America, UK, Germany, France, Italy, Spain, Rest of Europe, China, Japan, India, Southeast Asia, Rest of Asia Pacific, Brazil, Rest of Latin America, GCC Countries, South Africa, and the Rest of the Middle East and Africa. Some key players of the global diabetic foot ulcers and pressure ulcers market are Smith & Nephew PLC, 3M Healthcare, Medline Industries, Inc., Organogenesis, Inc., BSN Medical GMBH, Acelity L.P., Molnlycke Health Care AB, ConvaTec, Inc., Coloplast A/S, and Medtronic PLC, among others.